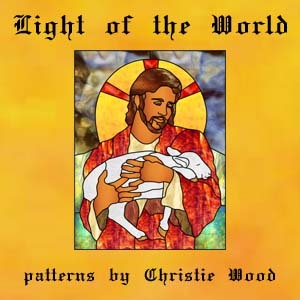 Light of the World features 60 designs by Christie Wood (and one bonus design by Ken Langton) depicting Christian symbols and the life of Jesus. The patterns cover a wide variety of styles, and range from the very simple to the large and complex. You'll find portrayals of people and animals, elaborate Victorian Christian symbology, as well as designs that are abstract or free form. You will also find several same-sized rectangular panels that utilize various textures of clear glass, originally created as leaded glass inserts for custom wooden pulpits.